It is very well known today that many companies are now utilizing IT Professionals on a contract consulting basis and in many instances, businesses are simply trying to capitalize on a resource that not only saves them time, but also money. Our expertise in finding, training, and retaining dependable IT human resources are demanding and expensive propositions. Combine this with the reality of fluctuating needs for technical resources in a typical IT environment, and it creates major staffing challenges for businesses, irrespective of their size. This is where we can help, by addressing your fluctuating resource needs through our staff augmentation services. Our Contract staff augmentation services are the ideal solution when companies are faced with constantly changing needs for IT technical resources. These transitory needs may be for developing new systems or to supplement in-house support staff during workload spikes. 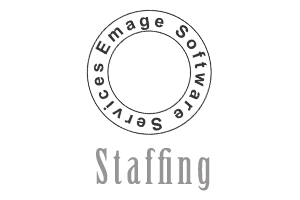 Emage Software has the competence and experience to augment your staffing needs with professional, high quality technical resources to help complete the task at hand. This contract staffing support comes at all levels from Business Analysts, Project Managers, Developers, Quality Assurance Analysts, DBAs to Architects. Once the project gets completed these resources roll off the job saving our clients the cost of carrying these resources, and the time and effort to redeploy. Our top-notch consultants have helped some of the biggest names in the business make those transitions with confidence, backed by proven hands-on experience. We currently have consultants performing varied tasks for our clients across multiple platforms and wide spectrum of technologies. We provide contract to hire services which are similar to contract services. This is a unique service that helps our clients acquire technically proficient consultants who, during the course of the contract, have demonstrated their expertise in meeting their dynamic needs on a contractual basis but later wish to extend full time employment after the contract duration. This service gives both our client and consultant an invaluable on the job opportunity to check each other out. Our client gets to observe the work performance of our consultant over a certain period of time, prior to making a formal job offer. The consultant also gets to operate within the work environment and see if it is a good fit prior to making a commitment to be hired on as an employee. It really is a win-win situation. Emage Software strives to deliver IT Professionals that meet your specific needs on time and within a budget you can afford. We initiate the process by understanding the type of resource that our client needs to fill a position, define the requirement, and finally find the ideal match for the requirement. Our direct hire services are perfect where businesses require the services of an IT professional on a long term basis, providing support and expertise needed to keep their operations running smoothly but may lack the recruiting expertise and infrastructure to reach and attract qualified candidates. With our vast experience in seeking out and knowing the best talent in the business, we are an invaluable resource for filling our clients hiring needs.